This paper is a joint experimental and theoretical approach concerning a molecule deposited on a large argon cluster. The spectroscopy and the dynamics of the deposited molecule are measured using the photoelectron spectroscopy. The absorption spectrum of the deposited molecule shows two solvation sites populated in the ground state. The combined dynamics reveals that the population ratio of the two sites is reversed when the molecule is electronically excited. This work provides the timescale of the corresponding solvation dynamics. Theoretical calculation supports the interpretation. 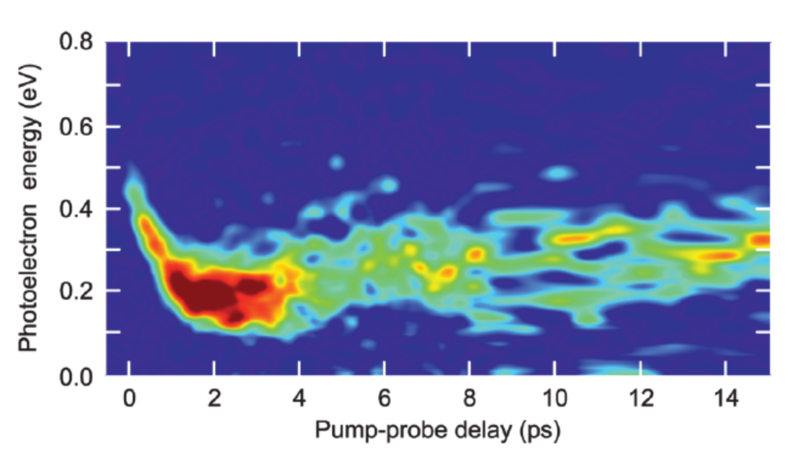 More generally, close examination of the short time dynamics (0-6 ps) of DABCOArn gives insights into the ultrafast relaxation dynamics of molecules deposited at interfaces and provides hence the time scale for deposited molecules to adapt to their neighborhoods. We investigate, theoretically, the joint relaxation of orbital and structure in postexcitation dynamics of Rydberg states of cluster BaArN (N = 250). Mixed quantum-classical dynamics is used to account for the nonadiabatic transitions among more than 160 electronic states, represented via a diatomics-in-molecules Hamiltonian. 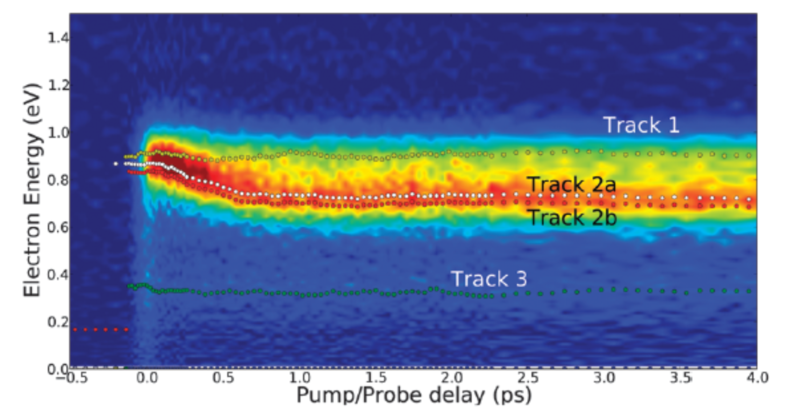 The simulation illustrates the complex multistep relaxation processes and provides detailed insight in the mechanisms contributing to the final-time experimental photoelectron spectrum. Photoabsorption spectra of KArn (n = 1-10) are simulated at temperatures ranging between 5 and 25 K. The calculations associate a Monte Carlo (MC) method to sample cluster geometries at temperature T, with a one-electron ab initio model to calculate the ground-state and excited-state energies of the cluster. The latter model replaces the K(+) core electrons and all the electrons of the Ar atoms by appropriate pseudopotentials, complemented by core polarization potentials. It also provides the necessary oscillator strengths to simulate the spectra. Global optimization by basin-hopping is used in combination with MC simulation at low temperature (5 K) to identify the most stable isomer and remarkable isomers of ground-state KArn clusters, which are stable with respect to deformations of the order of those expected with Zero Point Energy motions. The absorption spectra calculated for each of these isomers at 5 K suggest that absorption spectroscopy can probe sensitively the local environment of K atom: surface location of K with respect to a close-packed Ar moiety, number of Ar atom in close vicinity, and local symmetry about K. Simulation at increasing temperatures, up to the evaporation limit of K out of the cluster, shows the onset of large amplitude motions above 20 K, when the K atom experiences a variety of local environments. We present a combined experimental and simulation study of the 4s -> 4p photoexcitation of the K atom trapped at the surface of ArN clusters made of a few hundred Ar atoms. Our experimental method based on photoelectron spectroscopy allows us to firmly establish that one single K atom is trapped at the surface of the cluster. The absorption spectrum is characterized by the splitting of the atomic absorption line into two broad bands, a Pi band associated with p orbitals parallel to the cluster surface and a Sigma band associated with the perpendicular orientation. 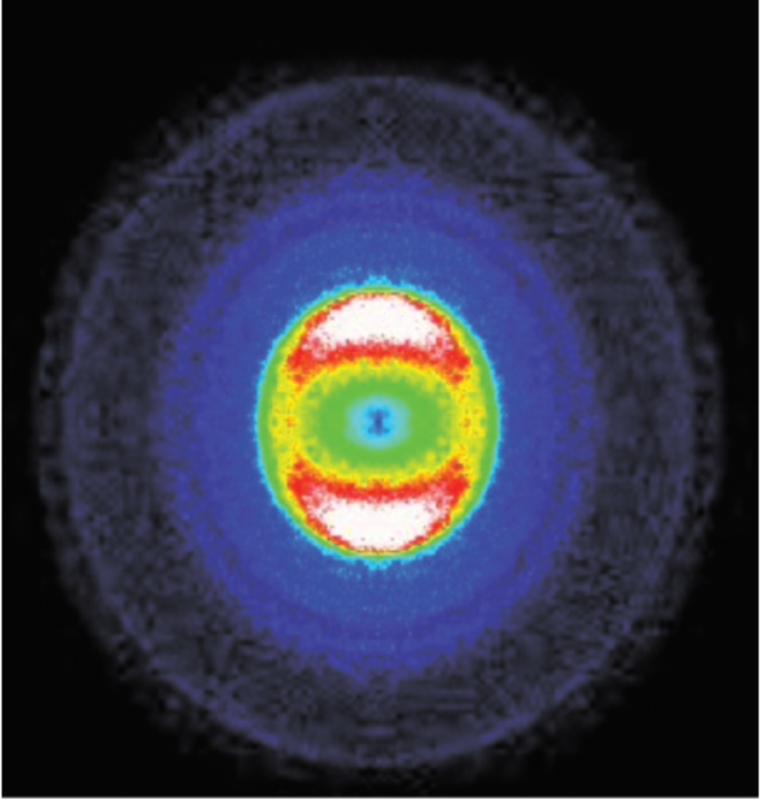 The spectrum is consistent with observations reported for K atoms trapped on lighter inert gas clusters, but the splitting between the Pi and Sigma bands is significantly larger. 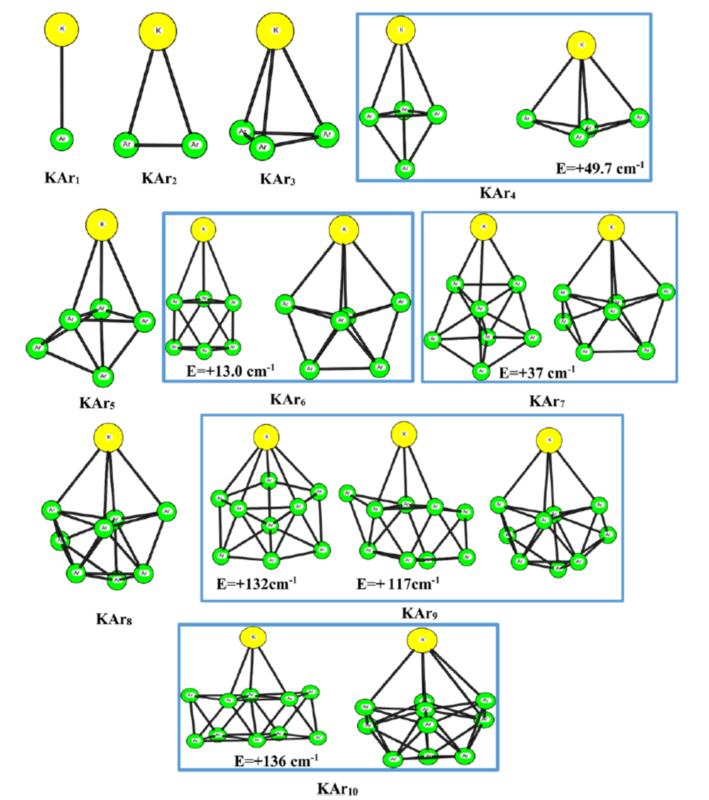 We show that a large amount of K atoms are transiently stuck and eventually lost by the Ar cluster, in contrast with previous observations reported for alkaline earth metal systems. The excitation in the Sigma band leads systematically to the ejection of the K atom from the Ar cluster. On the contrary, excitation in the Pi band leads to the formation of a bound state. 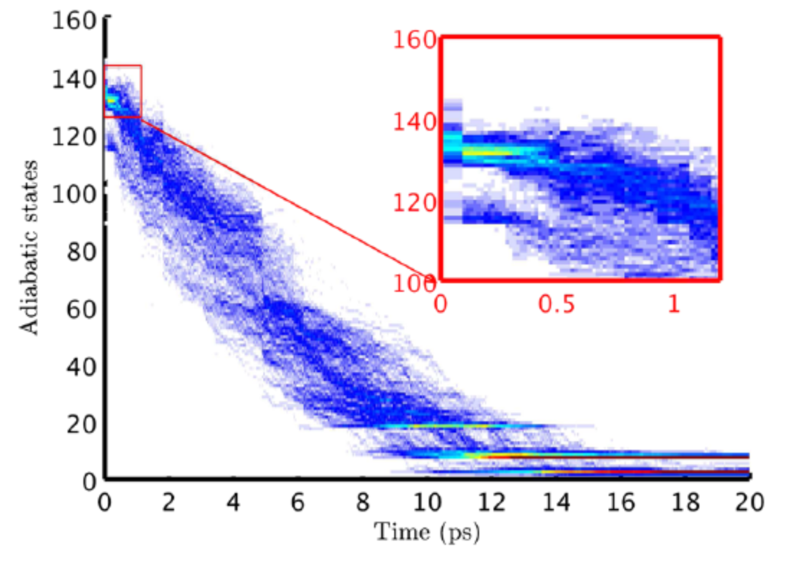 In this case, the analysis of the experimental photoelectron spectrum by means of nonadiabatic molecular dynamics simulation shows that the relaxation drives the system toward a basin where the coordination of the K atom is 2.2 Ar atoms on the average, in a poorly structured surface. 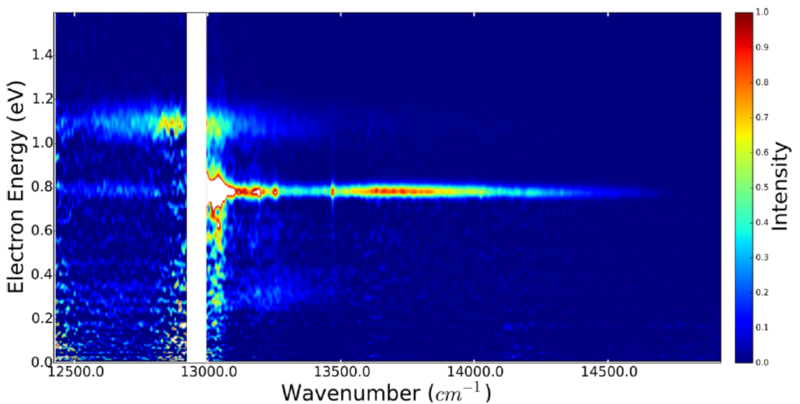 The dynamics of an electronically excited barium atom deposited at the surface of an Ar500 cluster was explored in a multipronged approach which associates information from frequency-resolved nanosecond experiments and information from femtosecond time-resolved experiments. In both types of experiments, the dynamics is monitored by photoelectron and photoion spectroscopy.